In preparation for beginning Project 333 this month, I took the “Dress with Less Microcourse,” an inexpensive self-paced course geared toward getting people ready to take on the challenge. One of my favorite parts of the course was the series of thought-provoking questions presented in the Day One materials. These questions really solidified my decision to participate in Project 333, as my answers made me more present to what my compulsive shopping and overly full closet were costing me, both on a financial and psychological level. I Know the Cold, Hard Truth – and It’s Not Pretty! If you’ve read my post titled “The Cold, Hard Facts: Finances,” you know I don’t need to estimate how much I’ve spent. The sad figures are all right in front of me in my QuickBooks program. The specifics are included in the aforementioned post, but the bottom line is that I spent $47,625.59 on clothing, shoes, accessories, and alterations from 2003 through 2012. That’s almost $50,000! If I had that money in my hands right now, would I spend it on clothes and the like? Absolutely not! I don’t even need a split second to consider my response. I feel that I have very little to show for my exorbitant expenditures of the past ten years. One might think I’d have an amazing wardrobe by this point and be one of the best dressed people around, but I don’t think so. My wardrobe isn’t awful by any means, but it’s not exactly extraordinary, either. I’ve made a huge number of purchasing mistakes over the past ten years, so much so that the vast majority of what I’ve bought is long gone by now, cast off to local consignment stores and charity shops. I’d like to think that other women are now wearing – and loving – the clothes I bought in error. The thought of my cast-offs being put to good use at least partially mitigates my intense shame and remorse. I think about the money, close to $50,000. My husband and I are not wealthy. We live in a 2-bedroom apartment and drive older cars that are paid for. Granted, we live in a nice area and have no debt, but our lifestyle is by no means extravagant. We love to travel but have done very little in recent years. After the wonderful honeymoon we enjoyed in New Zealand 11+ years ago, we vowed to take a trip to Australia within the next few years. Sadly, we still haven’t taken that trip! The money I wasted on clothing could have gone toward an amazing vacation in Australia, which I’m sure would have provided happy memories to last a lifetime. Instead, I bought countless items of clothing that I had to have in the moment but ultimately didn’t fulfill the needs of either my closet or my psyche. Many of those garments were lacking in both quality and “wow factor,” but they were “a good deal” and thus had to be bought. 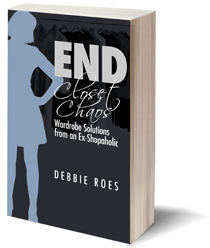 I adhered to a “more is more” philosophy which filled my closet but didn’t make me happy or well-dressed. Sure, I love some of the items in my closet and did make some good buys, but a majority of that $47,000-plus was spent unwisely. I bought things to “keep up with the Joneses” (but never really felt I did), look good in the eyes of shopping buddies and sales associates, follow trends I didn’t really care about, and for lifestyle needs I didn’t actually have. Those are all the wrong reasons for buying! Of course, I can’t get my money back and I don’t get a “do-over.” But I can learn from my mistakes and do things differently moving forward. I can become a smarter shopper and stop the impulse buying and succumbing to “deals” which ultimately aren’t deals at all. I can start adhering to the tips I give my clients on how to be a smart shopper, and I can begin anew today! I never like to end a post on a low note, so I’ll close by sharing 12 shopping tips I give to others and now vow to use in my own life. As you can see, I have lots of great shopping tips, but it’s time for me to start following them better! I can’t turn back the clock or erase my many shopping mistakes, but I can do better moving forward, and so can you. 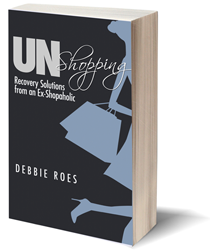 We have the power within us to truly be recovering shopaholics! There is nothing like cold numbers hitting you, isn’t there? I had mentioned in an earlier post that I gave up drinking my daily wine after I put the numbers together in dollar terms, and it wasn’t pretty. I am on week four now right along with your project 333, and things are going pretty well for me. While I have never been overspending in order to drink my wine, when it comes right down to it, a bottle of wine lasts not even as long a t-shirt that you did not need but wore a few times. So, Debbie, keep up the good fight. Your story is inspiring as we all have our little demons to fight. My little success story was when I stopped at a liquor store for a friend a week ago (we live in a dry county, and it is considered a courtesy since it is a 110 mile round trip), and I never thought about perusing the wine aisle for myself. I plan to reward myself with a Hermes scarf for Christmas this year. Love your blog. Cornelia, Thank you for your comment and encouragement! I appreciate your sharing your story as well. 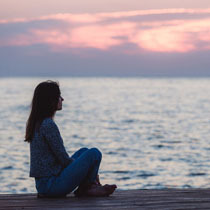 There are lots of parallels with compulsive behaviors. You’re right in that we all have our demons to fight. Congrats on being free of your wine habit! A Hermes scarf is definitely a great – and well-deserved – reward! Diane, Excellent point about colors. Sometimes people try to have too many colors in their closets and that can become overwhelming. Selecting a few core neutrals and a few accent colors definitely simplifies the process. I still have too many colors (I love color!) but have narrowed things down more recently. Thanks for sharing your insights! I really admire your honesty here. Even though I spend very little, I tend to overbuy. But I DO travel. I hope you and your husband are looking forward to another trip with all the money (and time) you are saving as you move forward in your project. Frugalscholar, Thanks for your comment. My husband and I don’t have any trips planned as of yet, but we definitely hope to resume our travel soon. It wasn’t just my clothing spending that held us back, but it definitely didn’t help! I’m so glad to be getting back on track in that regard now. Kim, Thanks so much for your wonderful comment! I’m glad you like my blog and are finding it helpful. I’m happy to have you as a reader! Oh, and I’m Australian, and we look forward to having you here one day! Kim, I hope to get a chance to meet you when I visit your beautiful country! What a great post! I have just done my annual wardrobe swap around where all the summer clothes come in and the winter ones get packed away. I was ill last year and had lost a lot of weight, an unhealthy amount, but I have managed to gain it back over the last year. The downside? A frightening number of items from last summer, that still have the tags on, that I can’t fit into now! Straight to ebay with them, and a lesson for this season, to the more about what I buy……. THINK more about what I buy! Mrs. Magrigal, Thanks for your comments. So glad you like my blog! I’m happy to have a reader in beautiful Ireland, another place I hope to visit at one point (I’m 1/4 Irish!). I’m glad you are back to good health. That’s the most important thing! It’s good that you’ll be able to recoup some of the lost cost for the extra clothes via Ebay. I’ve used Ebay as well as consignment for my items that are new or in good condition. Of course, it’s better not to buy so much in the first place, but we’re all learning!